At 20 years old, struggling with alcoholism and homeless, Robert frequented a local homeless organization for youth. Craving stability and a strong desire to change his life around, Robert acknowledged he needed guidance and support to get there. For assistance with finding a job, Robert was referred to Goodwill, where he enrolled in the Youth Program. While meeting with his Goodwill Career Coach to work on employability skills and career exploration, Robert expressed interest in learning about social enterprising with the Blue Spoon Food Truck. Part of the training included a 5-year Managers ServSafe Certification as a food handler, which is a requirement for hospitality supervisory/ management jobs in the State of Michigan. Robert participated in the Goodwill Hospitality training, where he acquired the skills and knowledge of the industry, subsequently passing his certification exam with high scores. For nearly two years, Robert has maintained his job in the Hospitality department at Goodwill. “Robert is a dedicated, hard worker and a valued team member of Blue Spoon and the local food truck scene in Grand Rapids. I am extremely proud of his accomplishments,” said Goodwill’s Director of Hospitality, Rock Dandeneau. No longer homeless and now sober for more than two years, Robert has made a number of positive steps to get on his feet and find balance in his life. He said “I love my job and my coworkers are now family. They are all understanding and hard workers.” Other people close to Robert have noticed the positive changes in him. 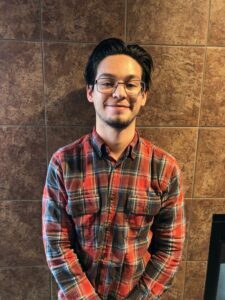 Robert is now a mentor for youth interested in pursuing hospitality. He is grateful for the support and opportunities and is able to now dream big for his future.